Addressing food poverty is not simply about making sure people have enough to eat. More important is working to ensure people’s incomes are high enough to be able to afford to choose good healthy food, which addresses the root causes of food poverty. One of the main challenges for food access in Oxford is that low incomes are largely out of step with the high costs of living, leading to widespread instances of in-work poverty. 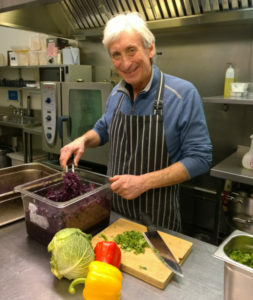 Thanks to funding from Oxford City Council and Food Power, supported by Oxford University’s Environmental Change Institute, we have worked on several projects that aim to increase household incomes for people at risk of food poverty and reduce their weekly expenses. 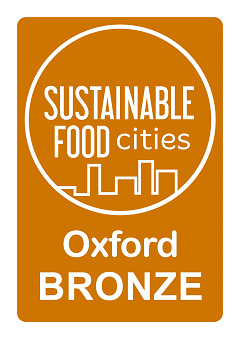 These include promoting free and subsidised food and meals through Oxford’s Food Services Map, promoting Healthy Start Vouchers, and research on the impact of the Living Wage in the local area. 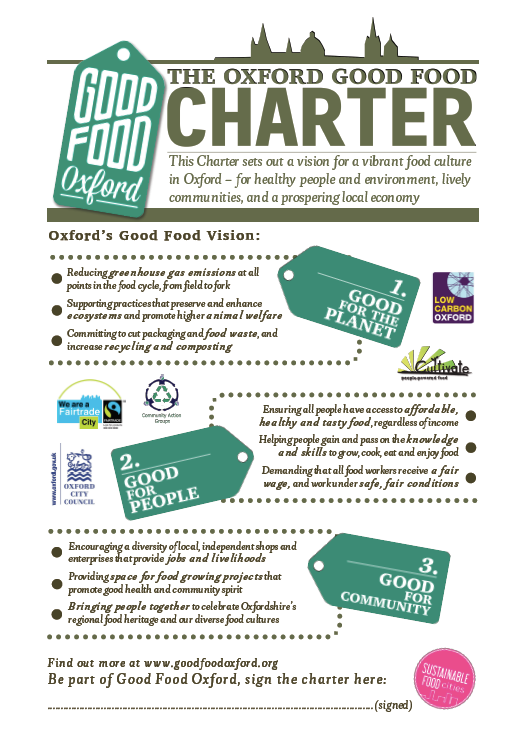 At Good Food Oxford we believe that fair pay which relates to actual living costs is essential to combat food poverty and to improve access to affordable healthy food. Several recent Oxford-based studies (e.g. Lalor 2014; Hansford and Friedman 2015) emphasised how many families with stretched finances frequently compromise on the quality of their diets, exposing them to greater risks of poor physical and mental health. 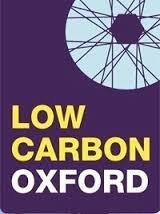 In autumn 2018, GFO’s intern Laura Green conducted research on the Living Wage to assess its potential impacts upon the lives of employees and the running of businesses in Oxford. A key aim of the report was to compare the affordability of a healthy balanced diet when living in Oxford on three different wages; the National Living Wage (NLW), the Real Living Wage (RLW) and the Oxford Living Wage (OLW). We also wanted to examine some of the potential benefits and limitations of the Living Wage by providing informative snapshots of the lives of employees living and working locally. The report features key findings from 25 interviews with employees and employers working at accredited Real Living Wage organisations in Oxford. When considering living costs in Oxford, the cost of housing is significantly underestimated within UK-wide estimates as indicated by the Minimum Income Standard. This is a public consultation method, which is used to inform the Real Living Wage calculations. It aims to establish the minimum income for individuals and families to achieve an ‘acceptable standard of living’, detailing minimum spends for various categories of everyday expenses, such as food, fuel and travel costs. 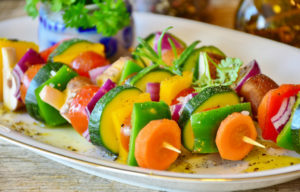 Once these greater housing costs were taken into account within budgets set by the Minimum Income Standard, it emerged that those on a low income would really struggle to afford a fully balanced diet (as recommended by the government’s recommended Eatwell Guide). A single person earning the government’s National Living Wage would only have £25.97 a week to spend on food, as opposed to the required £41.93 to afford the government’s recommended Eatwell Guide. 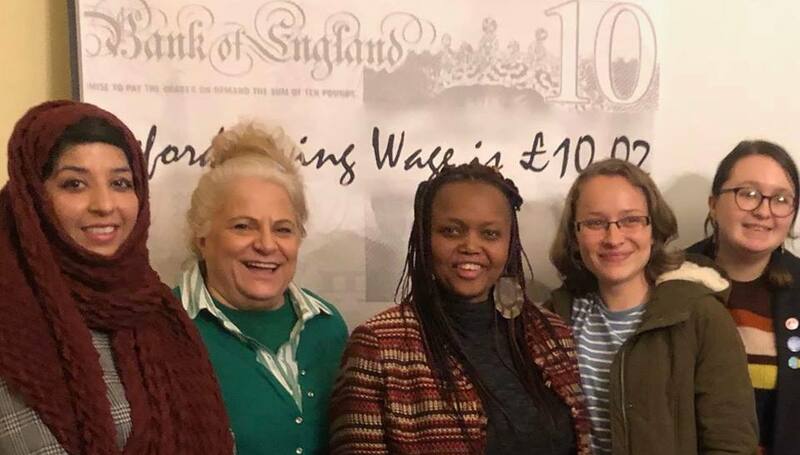 They would need to spend an additional £15.96 of their social and cultural budget on food to be able to afford the Eatwell Guide, leaving them only £10.82 a week to spend on social and cultural participation. On the Real Living Wage the deficit is £9.38 in Oxford, leaving £24.18 for culture and social life. And even on the Oxford Living Wage, there is a £5.24 deficit, which leaves a slightly healthier £32.59 left to spend per week on social and cultural participation – with its attendant health and mental health benefits. The interviews with employers and employees from accredited Living Wage organisations highlighted a wide range of benefits that paying a Living Wage has for low-income employees and their respective organisations. These include greater wellbeing, workplace productivity, better recruitment, and longer retention of employees.